As families wrestle with the ups and downs of life in peacetime Britain, the Anderson's strive to make things better for those in their community. In post-war Leith, the church bells have barely stopped ringing but the Anderson family must quickly come to terms with the harsh realities of peacetime Britain. As Johnny's hopes of a life in politics finally come true, his vows to remain a dutiful husband and father and to keep himself aloof from the murkiness of the Westminster establishment are proving problematic. Peacetime is not easy for Johnny's Polish brother-in-law Hans, either. Meanwhile, probationer nurse Kitty – Johnny's daughter from his first marriage – gets caught up in a sensational trial when her friend Laura's brother is accused of murder. Supporting Laura and her mother throughout the trial, Kitty becomes fascinated by the seemingly cold, eloquent and masterly prosecuting counsel – and he is equally bewitched by her. When they meet again four years later, will the memory of how he ruthlessly pursued Laura's brother prove to be a barrier to a future relationship? 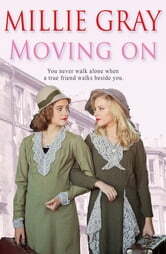 Moving On is a heartwarming saga of love, family and friendship in hard times, with the Anderson family finding that, even after the war is over, they still have problems of their own to resolve. From the bestselling author of In a Class of Their Own and Silver Linings, fans of Kitty Neale, Daisy Styles and Mary Gibson will love this story full of drama, heartbreak and friendship. I really liked this book. Following the family on their next chapter. The characters feel like old friends!! Great read. I had a hard time putting the book down. A very good title for a great read . This book was a very good read for someone who has to read on and off. The caricatures are all well explained clearly,so now looking back to see whose who. A nice book and a good read. No shock 's No bad language book a teenager could read and not be upset. Story was a little slow at times. Just a nice book with not much excitement. You can pickup your last page with ease .